A new year always brings resolutions and goals for all of us. I don’t necessarily make New Year’s resolutions but I do believe in setting goals for ourselves. One of the goals this year is to shed those unwanted pounds and start the New Year off with better for me food choices. While shopping in Sam’s Club the other day, I found the 3 lb. bags of Tyson® Grilled & Ready® Chicken Breast Strips. I knew it would be perfect to stock up on and to have on hand to make better choices when cooking. 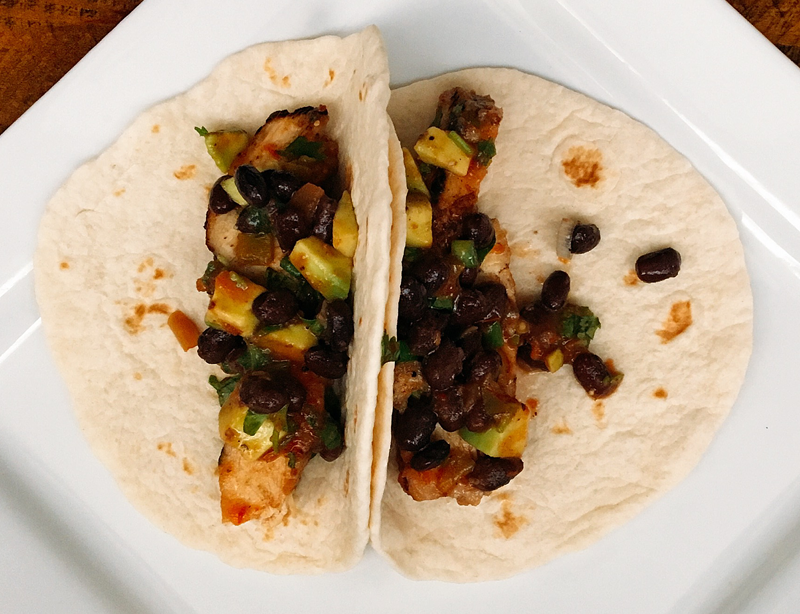 The Tyson® Grilled & Ready Chicken Breast Strips would be perfect for my chicken tacos and fajitas I enjoy cooking for my family. 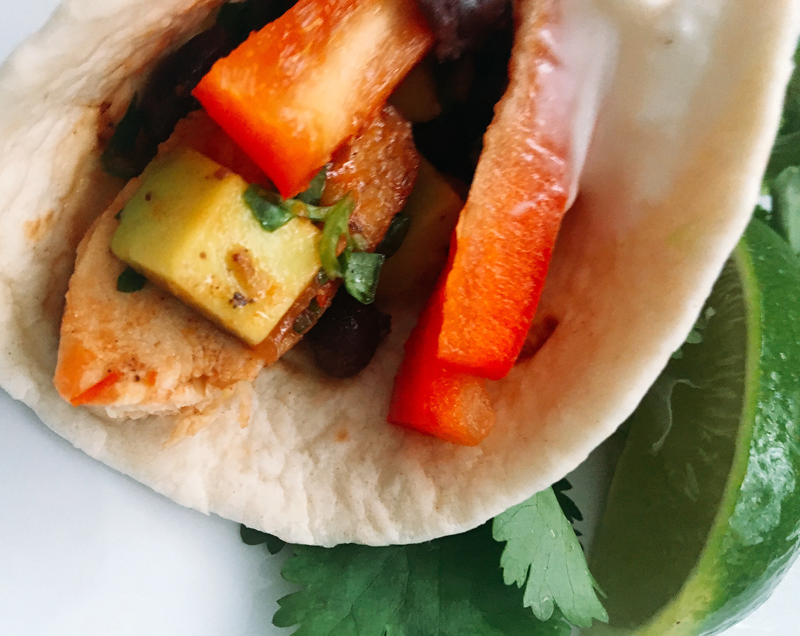 I’d love to share my better for you cilantro-lime chicken tacos recipe with all of you. It’s a better for you option for cooking for your family and delicious! Heat a pan on the stove top with a small amount of olive oil. Add the Tyson® Grilled and Ready Chicken until cooked through. 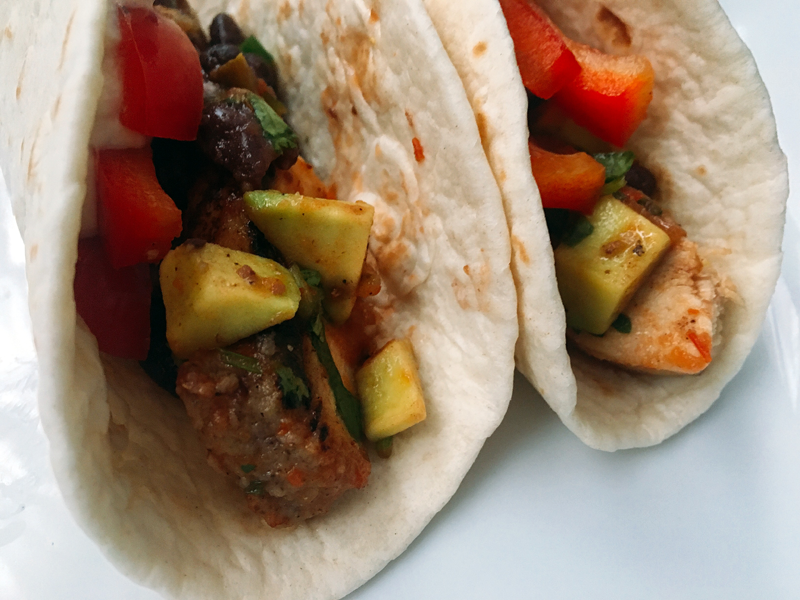 Combine the black beans, scallions and avocado and add to the chicken. Season with the black pepper. Toss together with chicken. In a separate bowl, combine the salsa, cilantro and lime juice. Toss into the chicken mixture. Heat your tortillas. If you’re going for the most delicious method I cook mine on the stove top with a little butter on each side until brown… but we’re going for a better for you option so heat in the microwave for a few seconds covered with a damp paper towel. 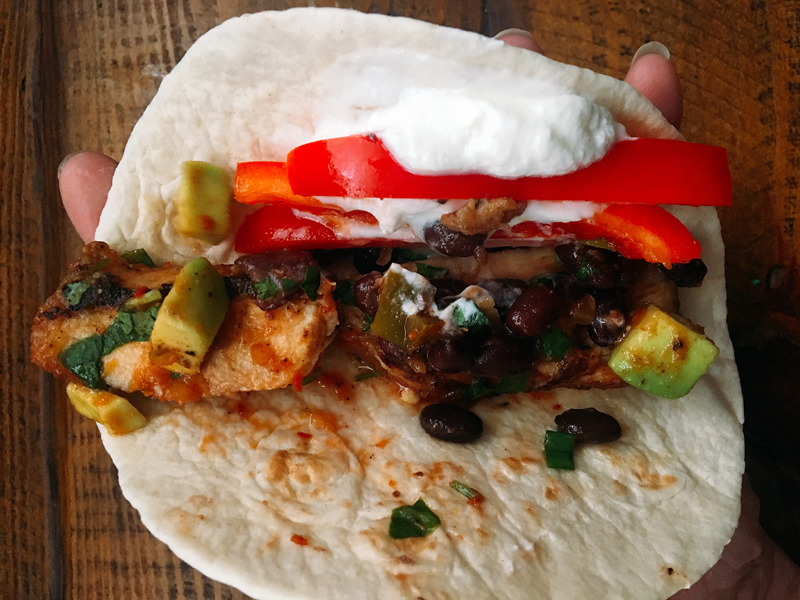 Add chicken mixture to tortillas, top with red pepper strips and a dollop of yogurt. Yogurt is the perfect substitution to sour cream. You can serve your chicken tacos with lime wedges and fresh cilantro for a pretty presentation. I love being able to grab the 3 lb. bag Tyson® Grilled & Ready Chicken Breast Strips while I’m at Sam’s Club. I can make such a great variety of dishes with the chicken. You could even thaw the chicken or warm and add to a fresh salad. So many options! Be sure to use the mobile app reward at ClubTysonGrilledReady.com to get $5 off 2 bags of Tyson® Grilled & Ready Chicken! What’s your idea for a better for you option with the Tyson® Grilled & Ready Chicken Breast Strips.? Comment below and share your ideas with us! 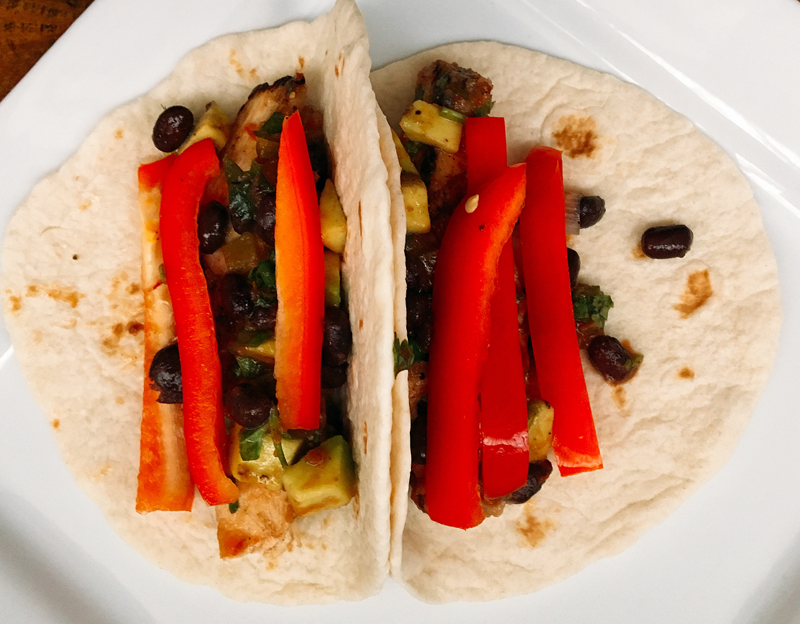 I am so hungry right now and these chicken tacos look great. I have tried the Tyson grilled & ready chicken breasts before with a salad and it was delicious. Now time to make tacos! Except I may make mine with green ile, sour cream and cilantro. Yes, so delicious! You can make these in so many different ways! Oh yum, I’m all about easy quick dinners and this looks like one that fits the bill and delicious too. Thanks for sharing! Whenever I buy Cilantro i have a lot left over, always! So, i make Cilantro Lime Chicken, which fortunately everybody likes! I would really love to make this but my sister isvallergic to cilantro and basil. can you suggest another herb to use? the only thing I can think of is flat parsley…but its so…well, parsley? These look delicious! I think we’ll have these for dinner tomorrow night. Thanks for the tip on saving $5 on tyson chicken.